Why SaaS Business Needs a Mobile App? Software as a service (SaaS) is a model of software distribution. The distinctive feature of this model is that users rent the software on a monthly cost-per-user or usage basis instead of buying and implementing software. Also, users can scale up and down the scope of service if needed. The essential characteristics of this model are hosted applications, a price that based on subscription, and the sharing between multiple users. Strategy Analytics Mobile Workforce Strategies (MWS) report “SMB Mobile SaaS Forecast 2011-2017,” says that the small and medium markets for software-as-a-service enterprises are going to grow from $6.7 billion in 2012 to $19.7 billion 2017. The Same prediction is also provided by Gartner Inc. They predict the extension of global spending on SaaS apps to $201 billion in 2019 compared to the $149.9 in 2015. This is about 7.5% for four years. However, the better part of spending will go for modernizing and functional expanding of office applications. Developing SaaS apps with cloud-base technology is going to replace the outdated software in enterprises. Software as a Service is used not only with desktop or laptop devices but also on the mobile devices. Sometimes the SaaS app only adds value to the service or can be used as a dashboard to provide reports for stakeholders. However, SaaS app also can act as a full-fledged independent player as it occurs with LinkedIn or Dropbox. So, what`s the difference between Software as a Service application and stand-alone app? SaaS app doesn’t need any desktop downloads. The user can access the service with direct download from the app store or the computer using secure login. The typical monetization model of SaaS app is a monthly fee that is based on users amount, storage capacity or other features. In stand-alone apps, the cost is determined per person and paid only once. Therefore, SaaS model in the long term is more beneficial for the vendor. SaaS is perfect for teamwork and allows all members of the group to interact with each other in real time. Stand-alone apps are not able to ensure users with back and forth communication. Mobile SaaS app development is based on cloud technologies. This means that the complete information from all team members same as updates is saved in the cloud. In its turn, you need to export files to Dropbox, email or another service to share the information from the stand-alone app. Judging by the trends, cloud-based SaaS mobile application development became a mainstream amongst enterprises. The rise of mobile devices had an enormous impact on this technology. Just think about these figures. In 2010 tablet devices generated $300 million in global app sales. In 2015 that number had raised up to $8.1 billion. John McCarthy, the Forrester Research Vice President in his report “App Internet,” had underlined the biggest advantage of SaaS apps. It comes from the ability to work offline. John McCarthy even implemented a new term “offline cloud apps”. However, this is not the only benefit. Despite its popularity, it comes to many questions and misconceptions when you need to build a SaaS application. However, to develop mobile apps for SaaS become not a trivial question. Your SaaS app development company should take into account the high performance of the app, the ability to be multi-tenancy and reconfigurability and of course the security issues. Like any other technology, software as a service deploying has its pros and cons. 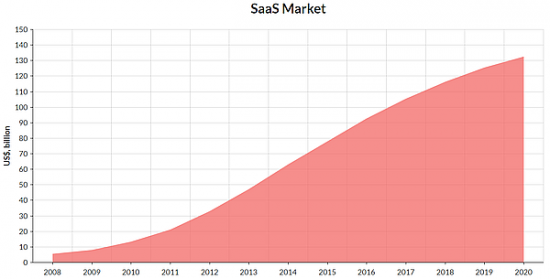 The SaaS monetization model is a monthly subscription. It means that you as a vendor can plan and predict proceeds that are based on the number of your SaaS app users and the amount of services that you provide. As your client`s business grow, you don`t need to worry about scaling yours. The customer can only adjust the monthly subscription according to his needs. No matter how big or small your client`s business, he can always rely on your service because that is way cheaper and easier than to invest in in-house software licenses and server capacities. All your clients need to set up your SaaS app is a device and internet connection. This simplicity makes SaaS particularly attractive and relieves the vendor from unnecessary cares. The additional benefit for your clients is that they have no need to update software and take care of outdated hardware what removes the workload from their IT-departments. For you as a vendor, the main benefit is that you don`t need to waste the time for visiting and updating every customer separately. Even if something goes wrong with your servers, your customers can always go back to the previous savings with the backup log and get access to the information from any device with internet connection. As you have noticed, SaaS has benefits both for vendors and for customers. Low variable cost based on usage instead of upfront fixed cost. Scaling helps to capture cost savings. Of course, like any other technology, SaaS has its pitfalls that are not critical though and could be troubleshooting. Safety is always a number-one concern for any business, startup or a private user. As a service provider, you need to protect sensitive client`s data. At The App Solutions, our engineers ensure customers with multiple methods to protect a SaaS app. Outages do happen with any service and technologies. We all remember the epic Amazon EC2 outage for instance. The primary care of your engineers is to prevent them as carefully as it is possible. Of course, you need to think about technical and communication strategies in case of outages. Then even the accident happens, you and your team will eliminate it with minimum customers and reputational loss. Well, this, not a con, rather a warning. Help your client to investigate the legislation and determine the regulations that apply to their business. You may think “Ok, I provide my SaaS model through the web platform, why do I need an app for that.” But don`t rush to make a final decision. Even if you have a responsive website, it doesn`t replace an app. As we said at the beginning of the article, the number of mobile devices rapidly extends, and the world itself is becoming more mobile. Providing your customers with an app you give them access to your service at anytime, anywhere all over the world. Isn`t it what you wanted? To be with your customer 24/7 and become an integral part of his business. Your native app saves your client time to open the browser and navigate to the tasks. Instead of this, you can give them a custom app that meets the standards of their smartphones with UI/UX design and fast app performance. Also, an app provides invaluable mobile-centric involvement for the most loyal customers and spurs for new feature purchases to extend the experience. To reduce your SaaS app development cost and make it easy to other applications and services they have on their smartphones, you can use sets of API`s that every SaaS app needs: authorization and authentication API, user management API, usage metrics collection API, operational data store. Stick to the native app development to provide better security, faster performance and get access to all inbuilt capabilities of the device.